Retail fashion makes up a large section of the consumer good market. It is a market which is typically distinguished by rapid shifts in consumer demand, a large number of competitors and brief product life cycles. Retail fashion is the ensemble of three divisions in fashion; couture, ready-to-wear and mass fashion. In 2015, the fashion industry contributed £28 billion to the UK economy alone. It is an industry which is constantly evolving through trends, art movements, economic demands and digital expansion. 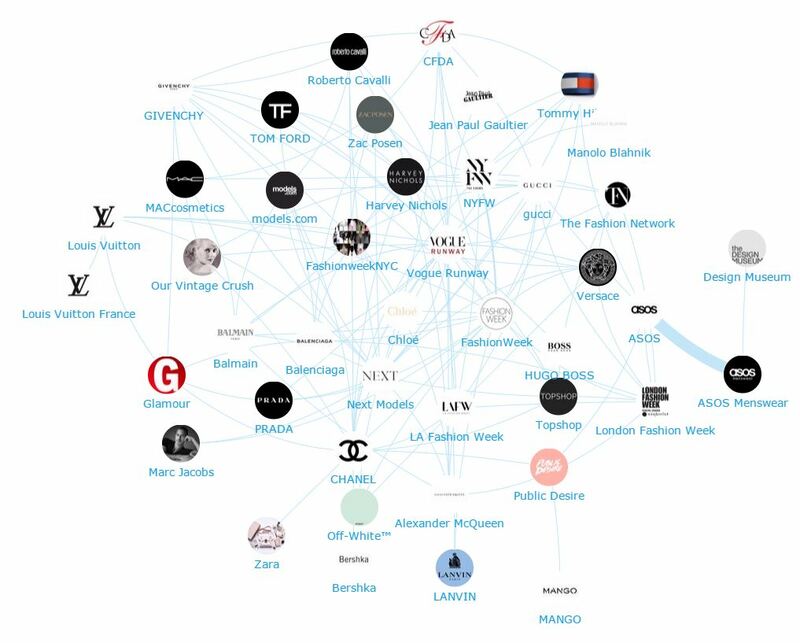 We were very interested in seeing which influencers, brands and publications were leading the discussion in the fashion industry on social media, so we sourced the leading influencers, brands and publications from Instagram, YouTube and twitter mentioning all the keywords relevant to the retail fashion industry. We then added these accounts into our database, categorised and curated by hand a list of the top 300 influencers, brands and publications ranked on a combination of the 4 Rs (Resonance, Relevance, Reach and Reference) using their Twitter data. These accounts were then added into our Influencer Relationship Management software (IRM) where we could map and analyse their conversations. 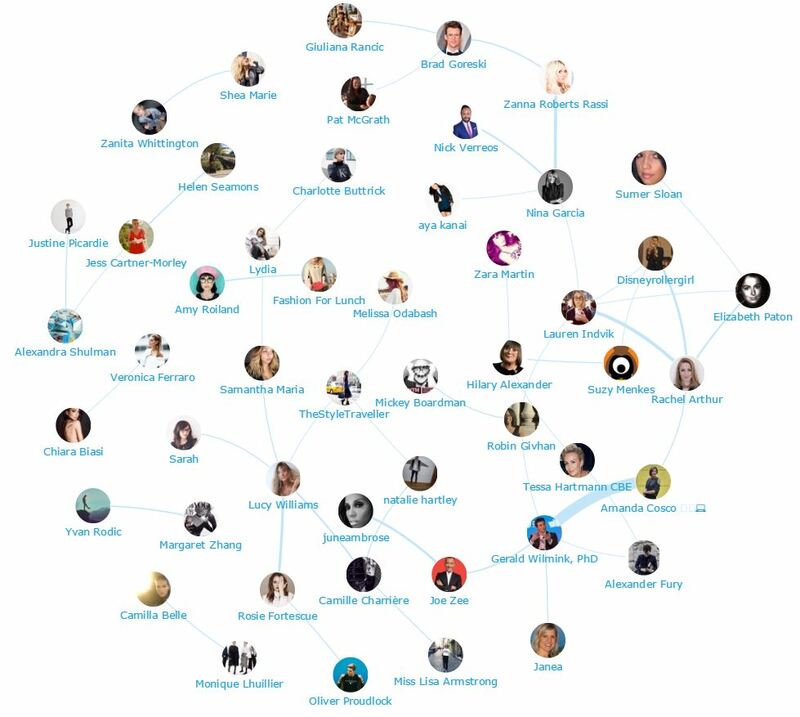 Below you can see a network map of the conversations among the top retail fashion influencers. Be sure to click on the map to enjoy the full size network diagram in greater detail. Below is a list of the top 50 retail fashion influencers. If you want to see who ranks from 50-100 be sure to download the full report by clicking the download button below! From the word cloud above you can see some of the words that resonate the most among the influencers. 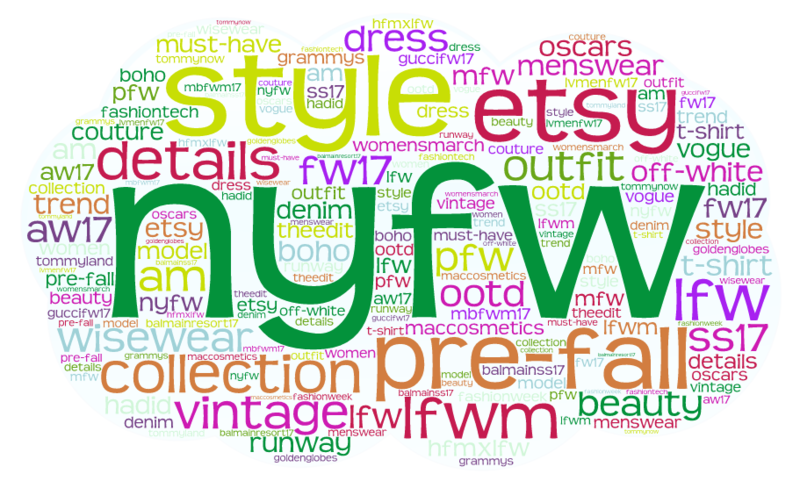 New York, London, Milan and Paris fashion weeks have been a key focus of conversation among brands and individuals, and as a result some of the most popular hashtags used have been #nyfw, #lfw and #fw17. Similarly, models and couture-related topics were a common driver of interest. The name ‘Hadid’, surname of it-girls Gigi and Bella Hadid, was mentioned on numerous occasions due to their vast influence in the fashion industry. Haute couture stands firmly at the centre of conversations due to the impact it has on retail fashion as a whole; fashion houses create trends which are then mimicked and recreated for cheaper ‘en masse’ by high street brands. Below you can see another network map created with in IRM. If you are interested in learning more about identifying, managing and engaging with influencers click here to get in touch! Here is a list of the top 50 retail fashion brands. If you want to see who ranks from 50-100 be sure to download the report to get the full top 100 list! The brands’ key focus of conversation revolves around fashion shows and collections. New York fashion week resonated the most, followed by Paris and London fashion weeks. Individual brand collections were also key drivers of interest; particularly couture collections by fashion giants Louis Vuitton, Gucci, Givenchy and Versace. What we can gather from this word cloud is that brands tend to tweet about brand-centric topics; often posting about the season’s latest creations. 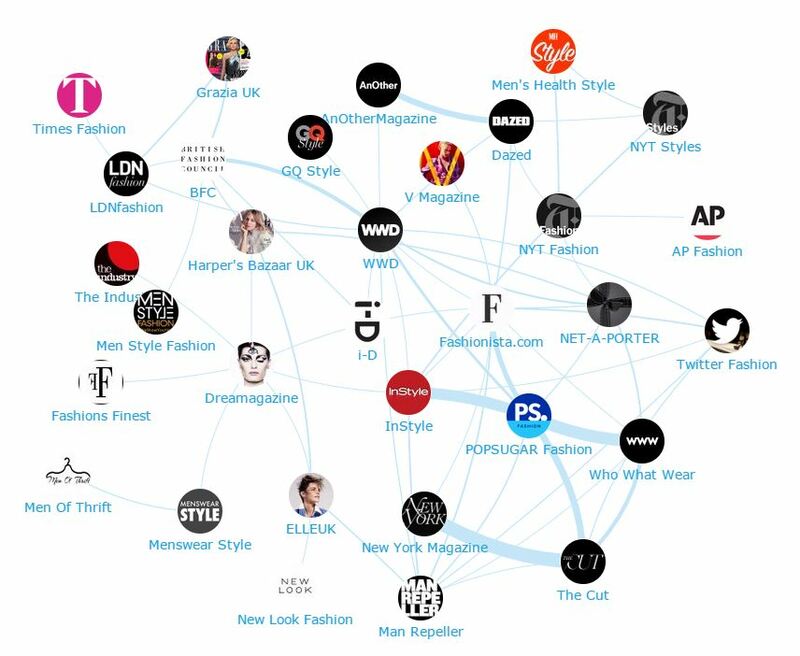 Here is another network map of the top retail fashion publications. Be sure to click on the map to enjoy the full size network diagram in greater detail. 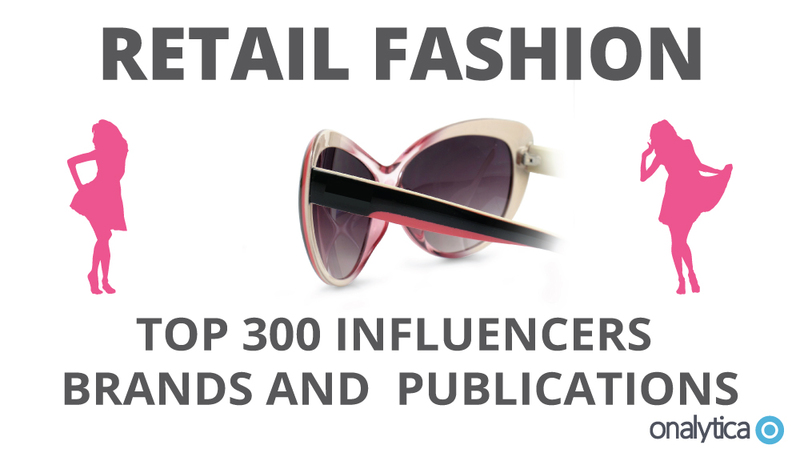 Below is a list of the top 50 retail fashion publications. If you want to see who ranks from 50-100 be sure to download the full report by clicking the download button below! 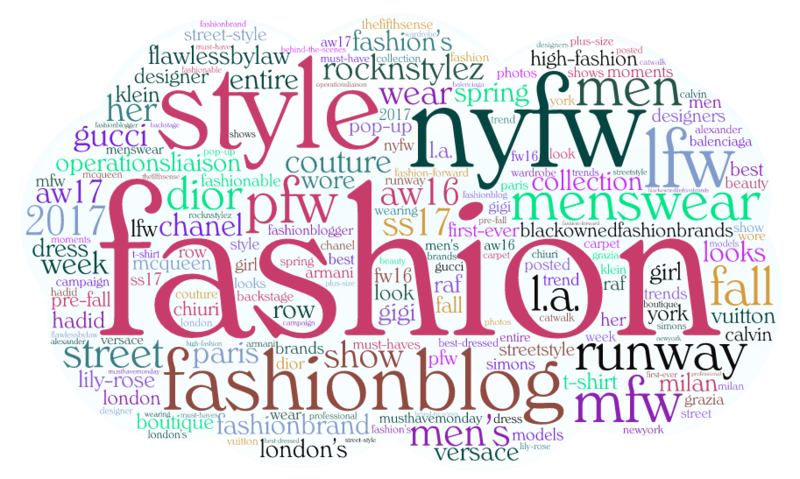 Fashion weeks and shows were also popular drivers of conversation among the top 100 publications. However, style and fashion behaviours more generally prevail the content shared by magazines and blogs. Trends and looks are a key focus area for these influencers and we can see that this resonates through hastags such as #streetstyle and #menswear. Effective influencer marketing starts with identifying relevant influencers for your brand. Onalytica’s new Discovery platform mines over 200 billion posts a year into a curated database of over 150K global social media influencers, including data from Twitter, Blogs, Instagram, YouTube, Facebook, LinkedIn Profile Links + Demographic Data. These influencers are then ranked by Reach, Resonance, Relevance and Reference. Disclaimer: As ever with these lists, it must be stressed that the ranking is by no means a definitive measurement of influence, as there is no such thing. The brands and individuals listed are undoubtedly influential when it comes to driving discussion around retail fashion. The PageRank based methodology we use to extract influencers on a particular topic takes into account the number and quality of contextual references that a user receives. These calculations also take into account a user’s resonance (engagement), relevance (number of tweets on topic) and reach (number of followers). If you want to learn more, please read our article that outlines influencer identification.